Neumarkt am Wallersee is a city with a bit less than 6,000 residents in the Flachgau area of Salzburg. It is situated by the lake Wallersee and approximately 25 kilometres north-east of Salzburg city, to which Neumarkt is linked via a railway and well-developed roads. 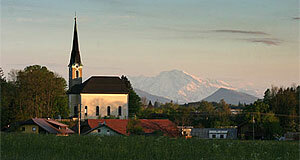 For the past 30 years, the relative vicinity to Salzburg has helped Neumarkt to grow and prosper - at the same time, the community lost much of its village atmosphere and turned more and more into a typical Flachgau town, where a fair part of the population works and socialises in the city. In terms of tourism, Neumarkt is no exception to other municipalities in the Flachgau: There are some hotels and B&Bs that make most of their money during the summer and the Salzburg Festival, but much of the tourism comprises of locals on day-trips. The Wallersee draws visitors from the further surroundings, as it is one of the warmest lakes in the province. It is one of the lakes of the Salzburger Seenland (Salzburg Lake District). Neumarkt means "new market", which refers to the fact that the town was officially founded as a new venue for markets in 1240. For centuries, Neumarkt served the Prince Archbishops of Salzburg as a border town and had a guarding function. In the early 17th century, the church of Neumarkt was heavily fortified. The architect of the Salzburger Dom cathedral, Santoni Solari, was in charge with this project which was done in 1638. Today, you can still see the Schanzhäusl in front of the church: This was the central gate of the walls. Like for much of Salzburg, the 19th century was a period of economic difficulties. Only with the rise of tourism this development was halted - in the case of Neumarkt, the 1920ies saw the arrival of guests of the Salzburg Fesival and the Wallersee became a trendy summer holiday destination. After WWII, tourism did not develop as rapidly as for example in the nearby Salzkammergut. Neumarkt was made a city in 2000. In terms of sightseeing, Neumarkt has a central market square and a town museum. Several buildings in this part of the town date back to the Baroque age. Note the town museum in the Fronfeste. There is a castle in Neumarkt which is called Schloss Sighartstein. People with a specialist interest might enjoy the late Gothic chapels of Neufahrn, Sommerholz and Pfongau. Note also the nature reserve and Natura 2000 area of the Wenger Moor at the lake. There is a public lido and a nice hiking path around lake Wallersee. Neumarkt can make a good base for exploring Salzburg, accommodation will be significantly cheaper than in the city. The lake might also be a good stop-over destination if you travel through this area.